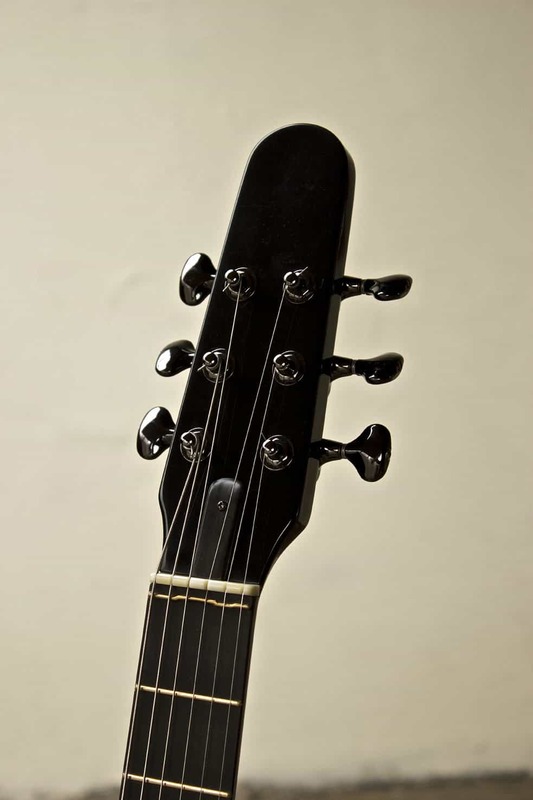 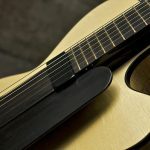 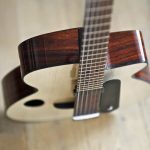 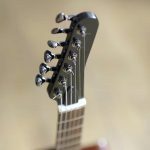 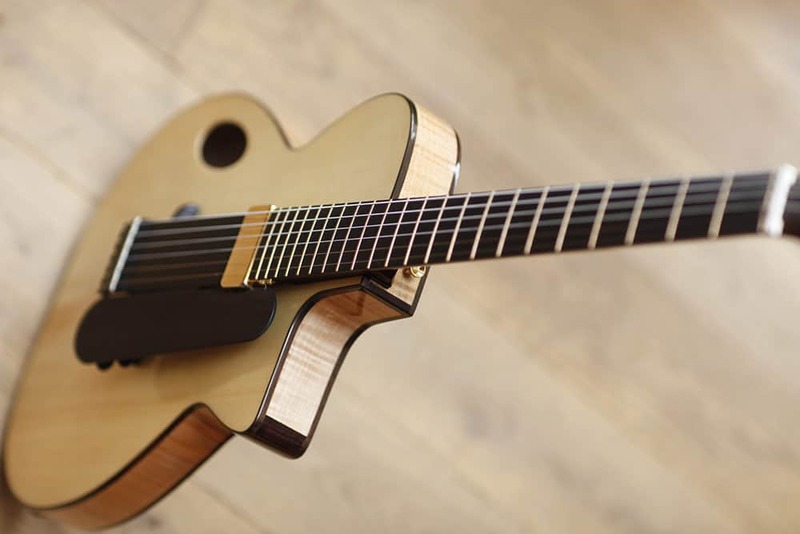 This design has so many benefits for the player – the sustain of an electric guitar coupled with the broad tonal range and resonance only possible from an acoustic instrument. 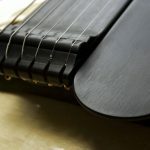 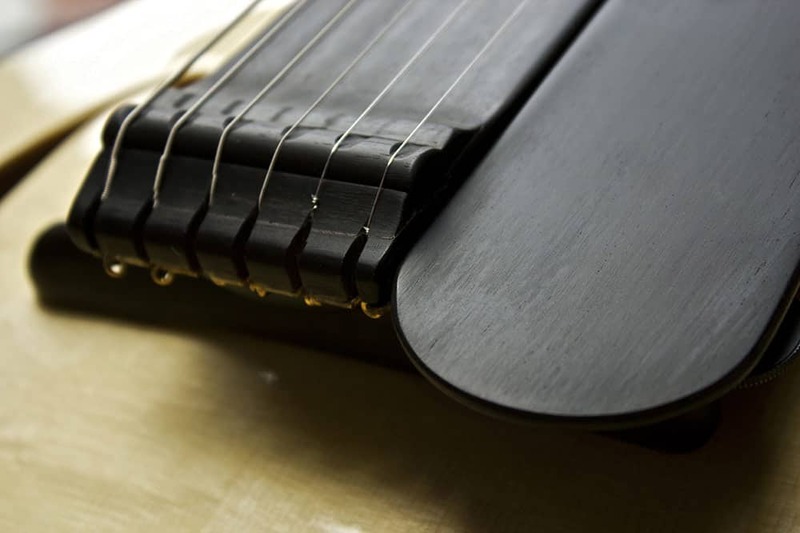 Add to this great access to the upper frets, a compensated zero fret and saddle making for super accurate intonation over the whole fretboard. 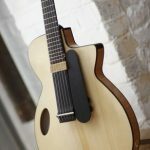 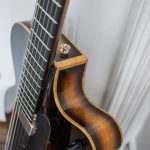 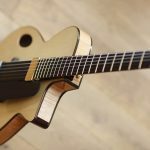 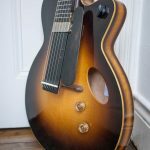 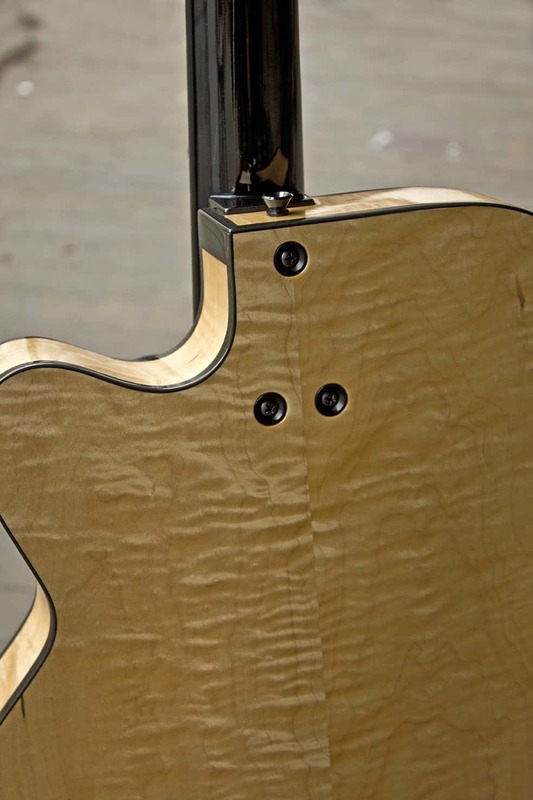 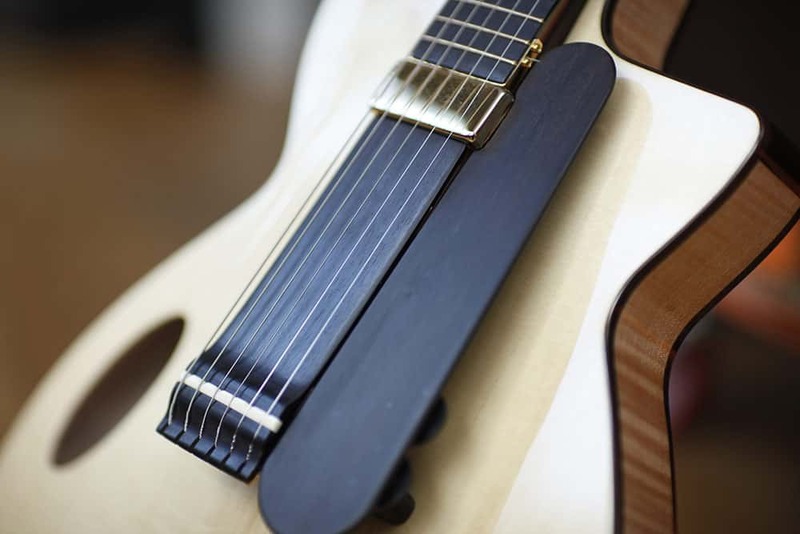 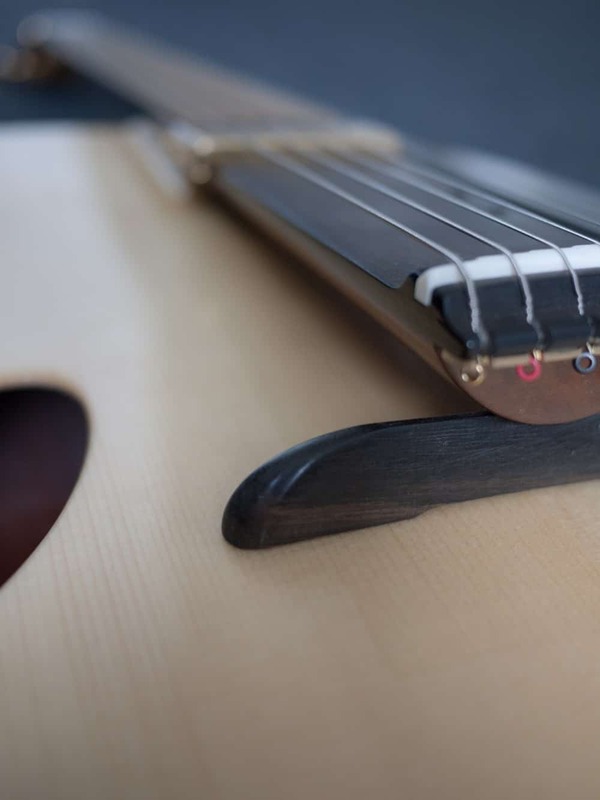 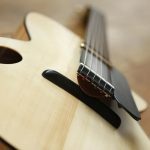 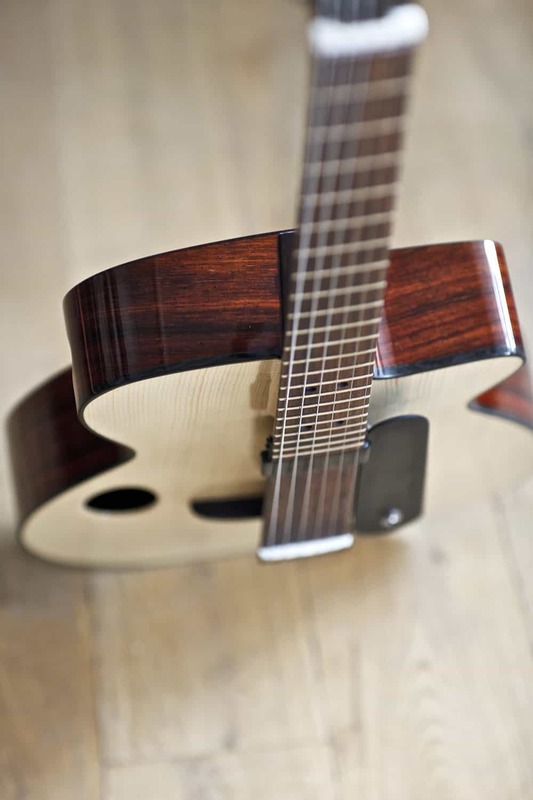 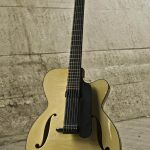 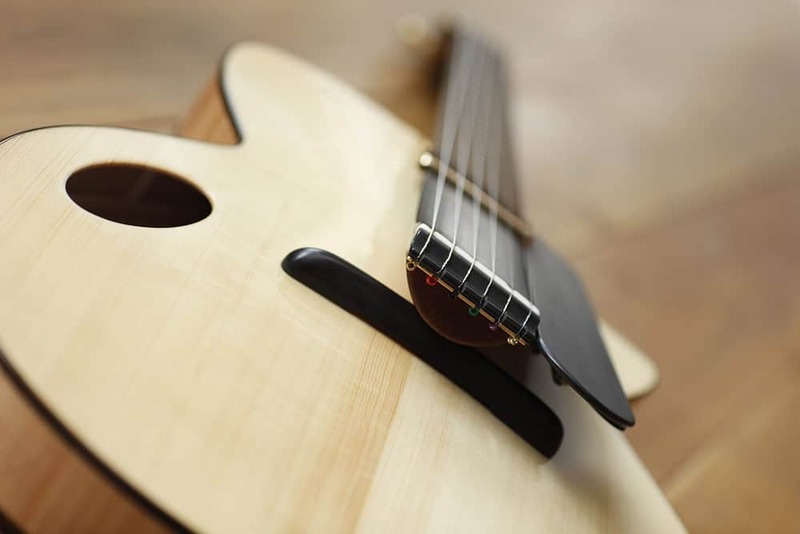 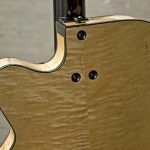 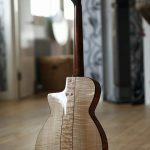 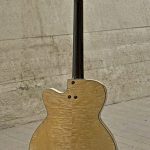 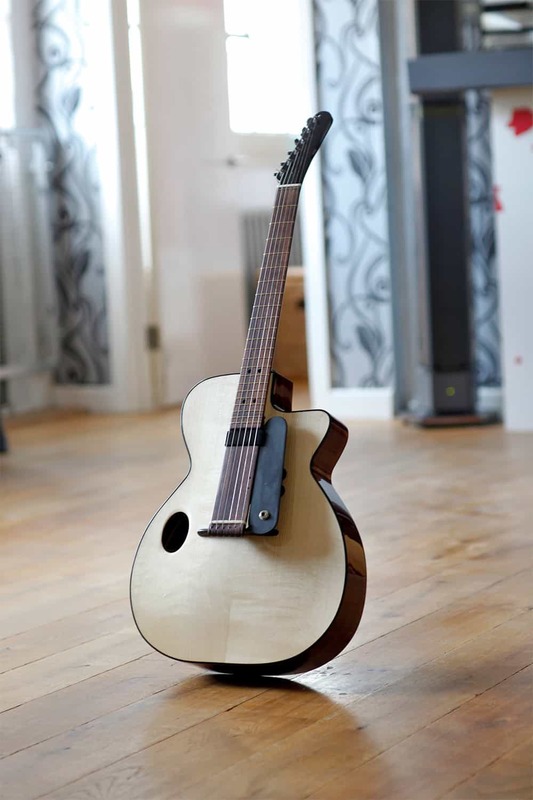 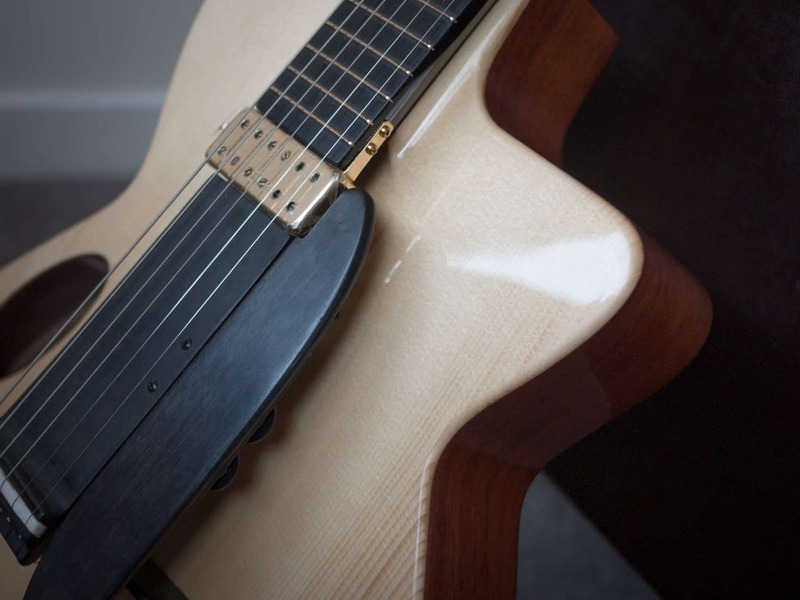 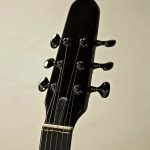 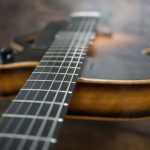 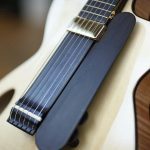 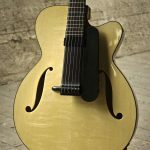 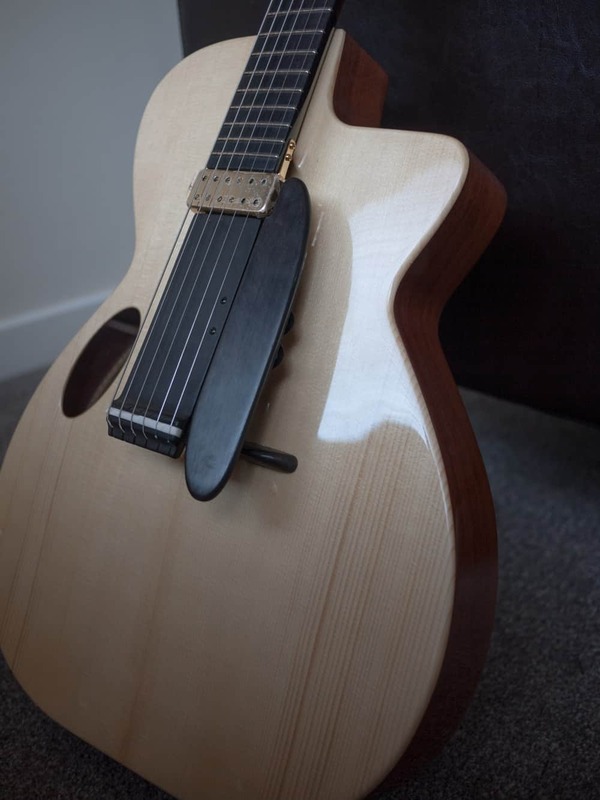 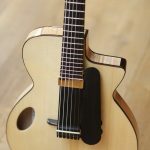 This “long neck” design is a total rethink of how archtop guitars work, there is nothing quite like this around anywhere. 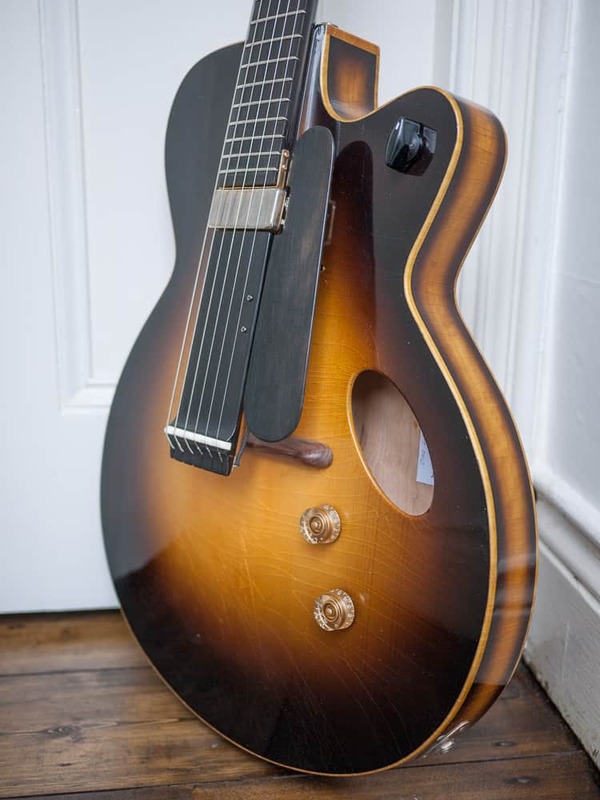 Pickup: Handmade Kent Armstrong AlNiCo III handmade jazz humbucker coupled with an old school paper in oil capacitor. 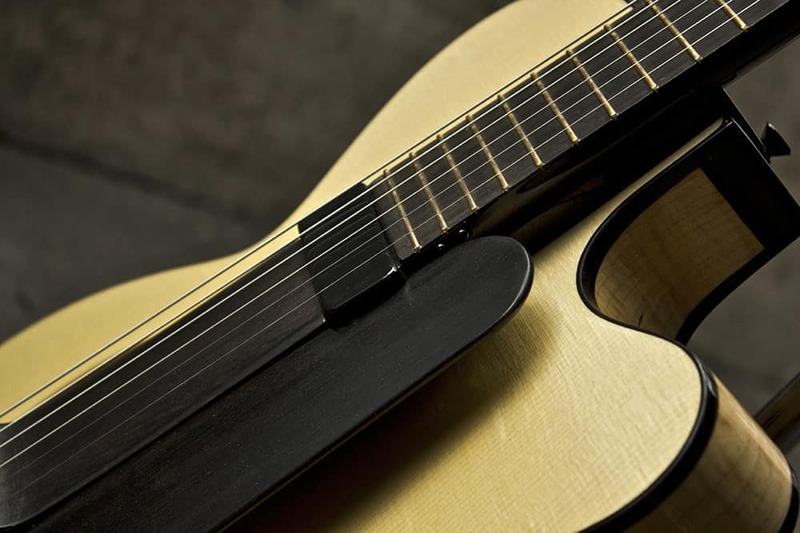 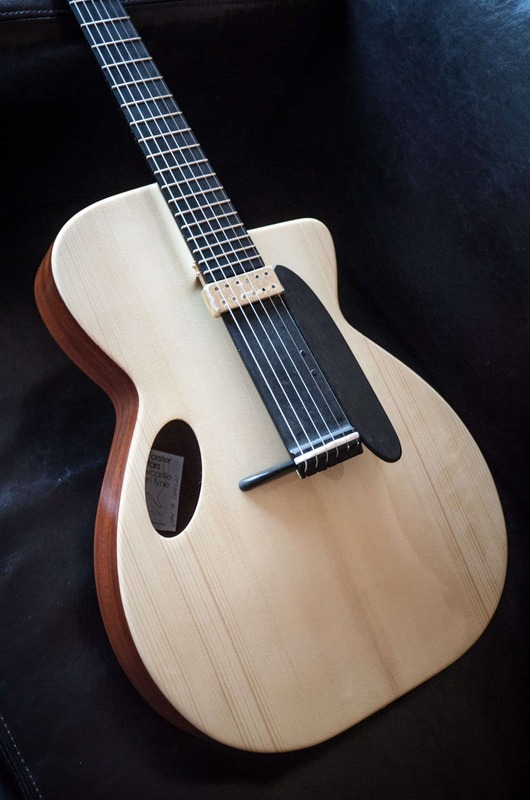 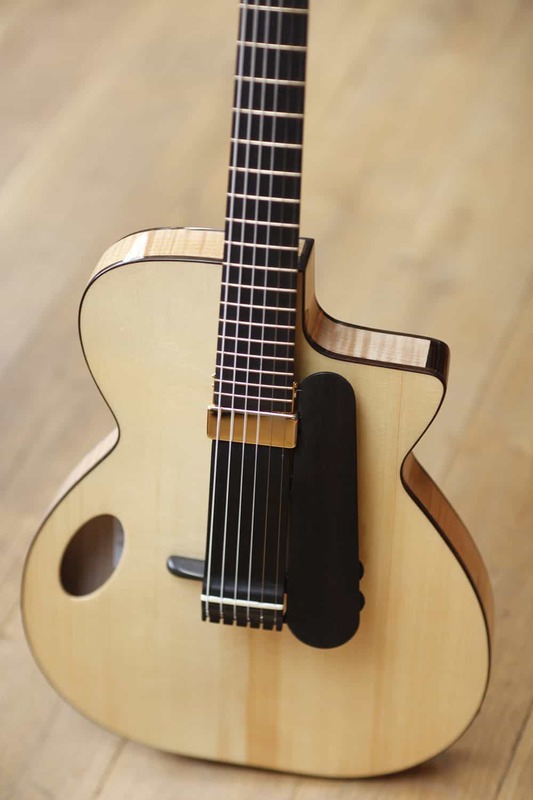 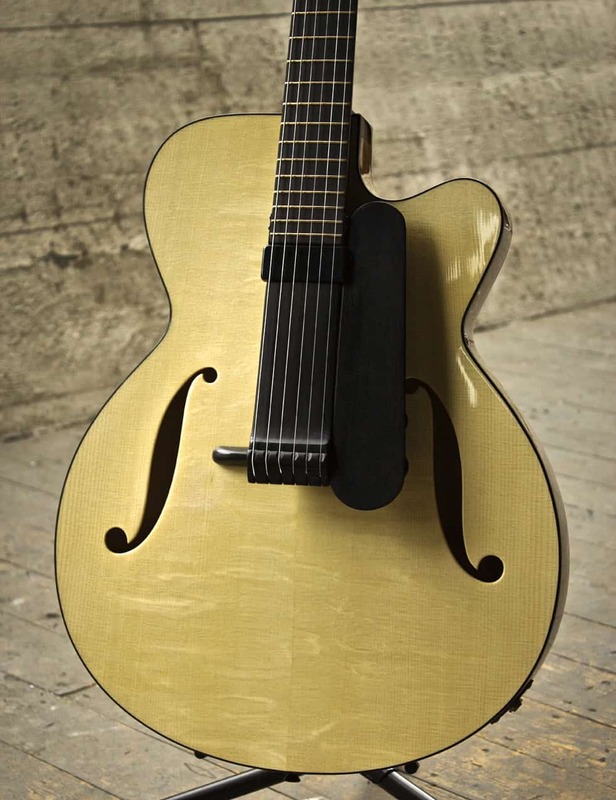 Here, the aesthetic influence is clearly from the great American archtop makers:a design that begin with Orville Gibson, and blossomed in the workshops of legendary luthiers D’Angelico and Elmer Stromberg, and later with James D’Aquisto, Tom Ribbecke, Bob Benedetto, John Monteleone, Steve Grimes and Steve Andersen, and many others. 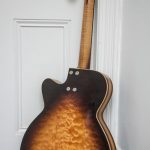 Whist “tipping my hat” to these master luthiers, I’ve taken this classic aesthetic, stripped it down and applied it to the superior “long neck” design. 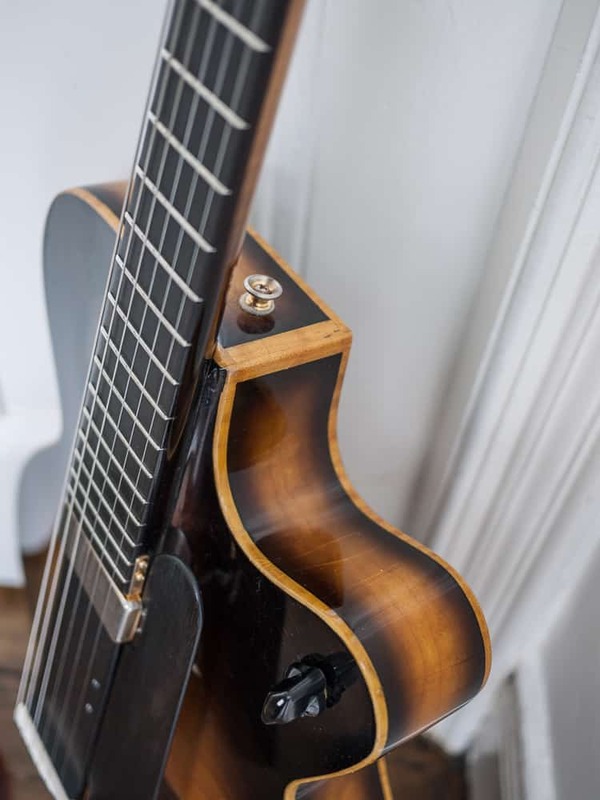 The bracing and arching of Oscar is a little different to that of “Charlie” and the sound is more “direct.” Electric guitar sustain without the weight. 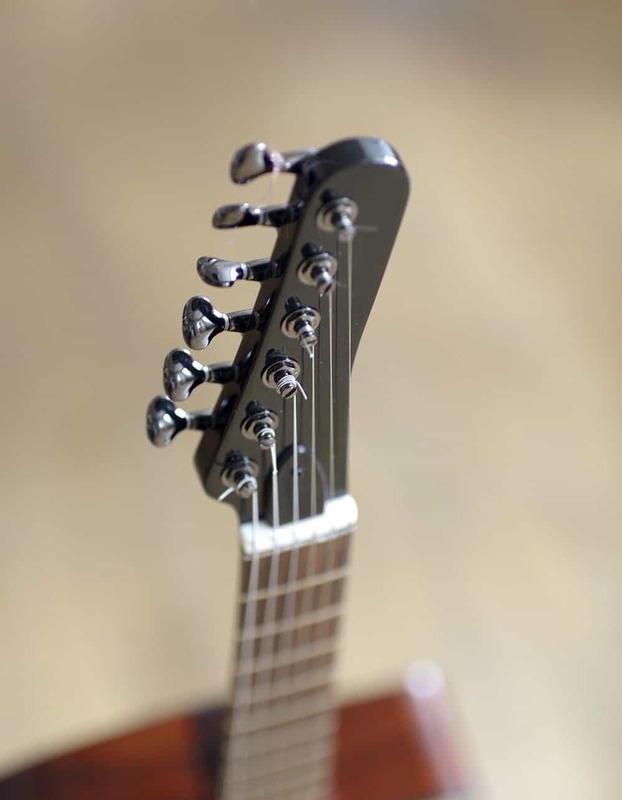 Resonance without the feedback. 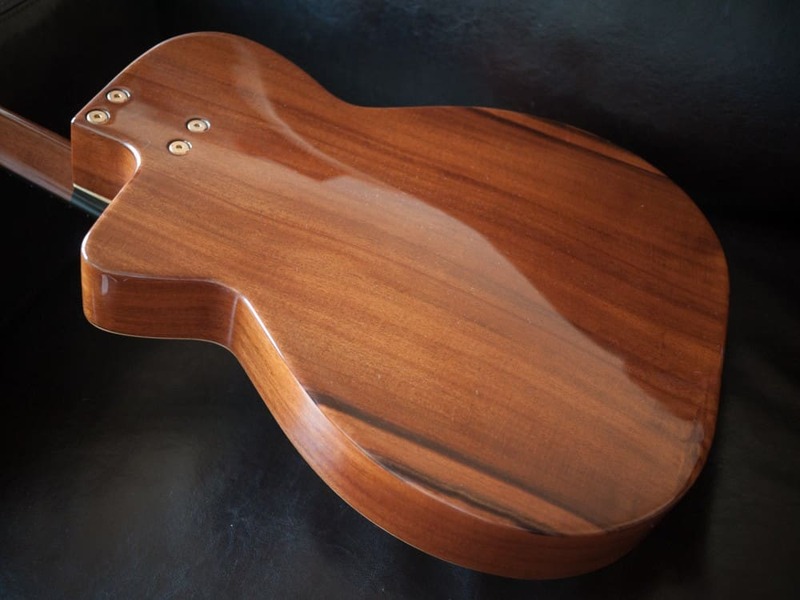 This feller pictured though has stunning cocobolo back and ribs and a solid Indian rosewood neck and fretboard (all one piece) for even more sustain depth and clarity. 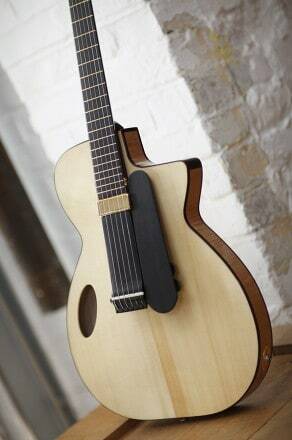 Looks nice too! 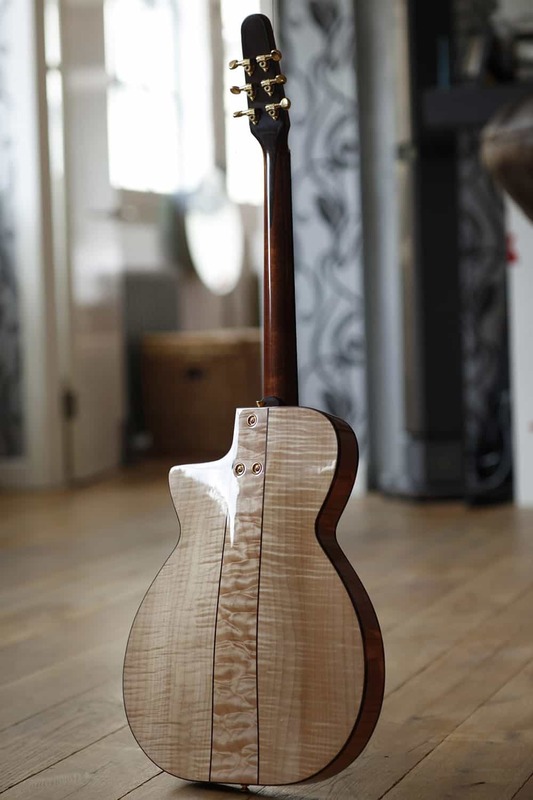 So this time the inspiration came form the wood itself. 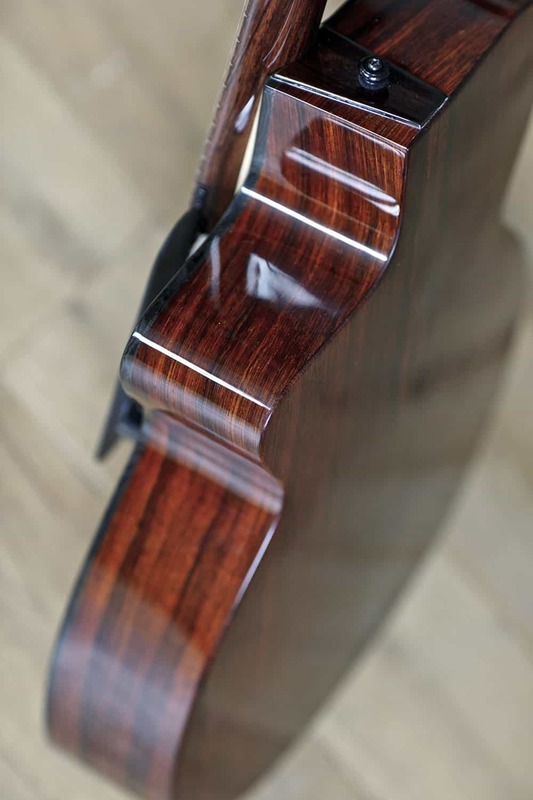 Years ago when I worked for Stefan Sobell we came across a huge board of reclaimed Cuban mahogany. 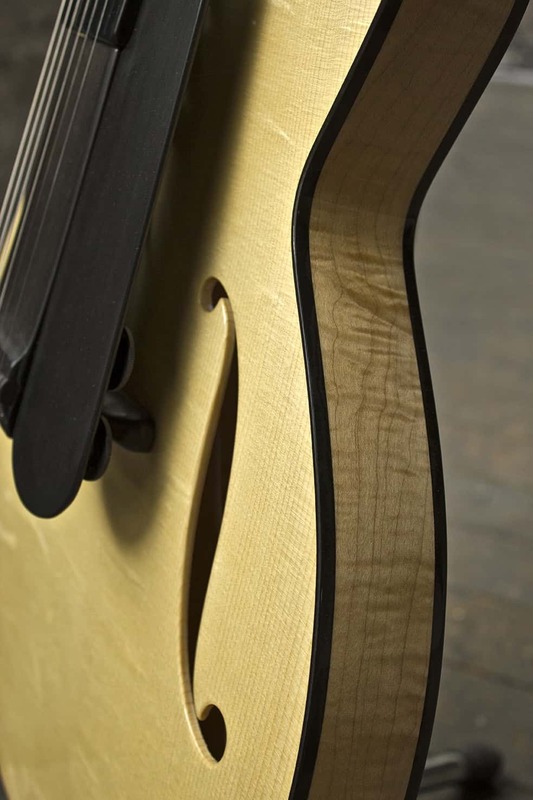 It must have been decades old as this timber has been commercially extinct for many years. 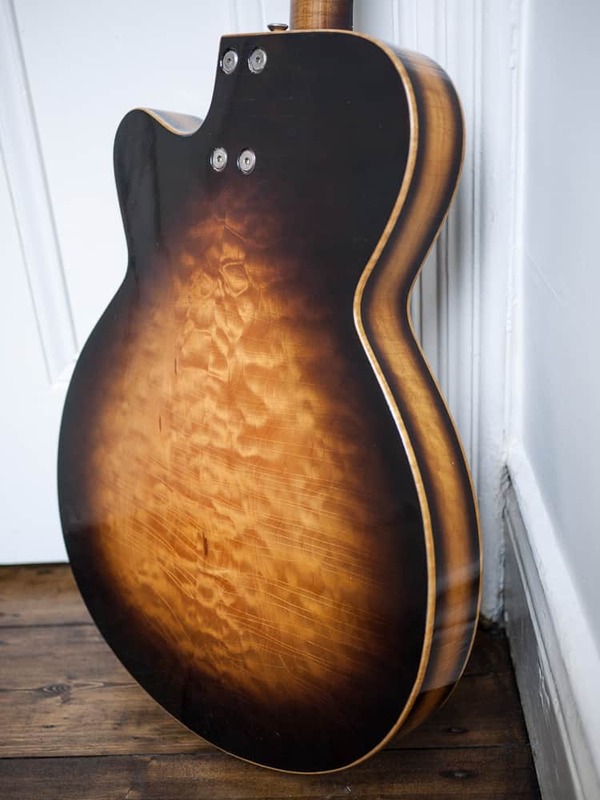 This huge chunk of history sat around my workshop for years and was very good at collecting dust and getting in the way, and tempted though I was to cut it up, I was just waiting for the right project. 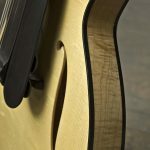 With timber like that you can’t just start cutting it Up and hoping for the best. 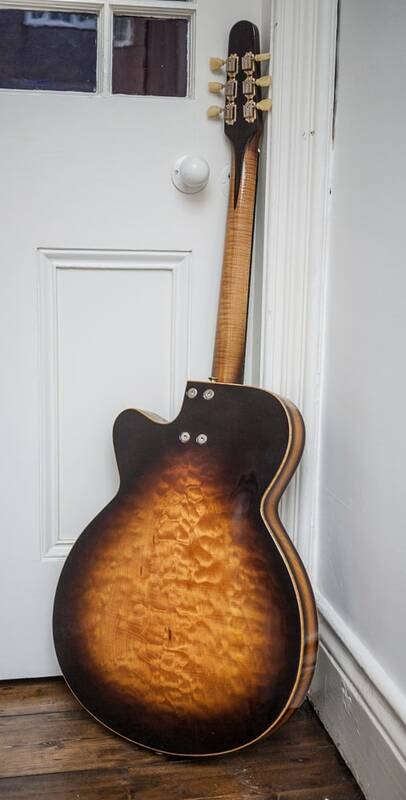 It’s just to valuable. 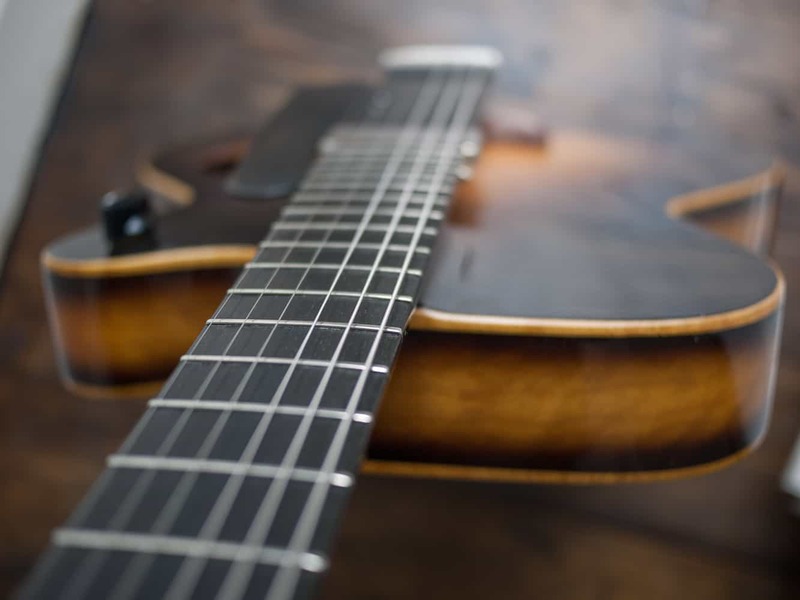 It’s no joke to say that this stuff “really doesn’t grow on trees any more…” That said, I’ve enough of this stuff for just a few more, but once it’s gone, it’s gone. 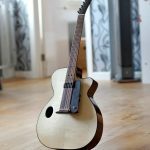 Pickup: Handmade Kent Armstrong Johnny Smith handmade jazz humbucker coupled with an old school paper in oil capacitor. 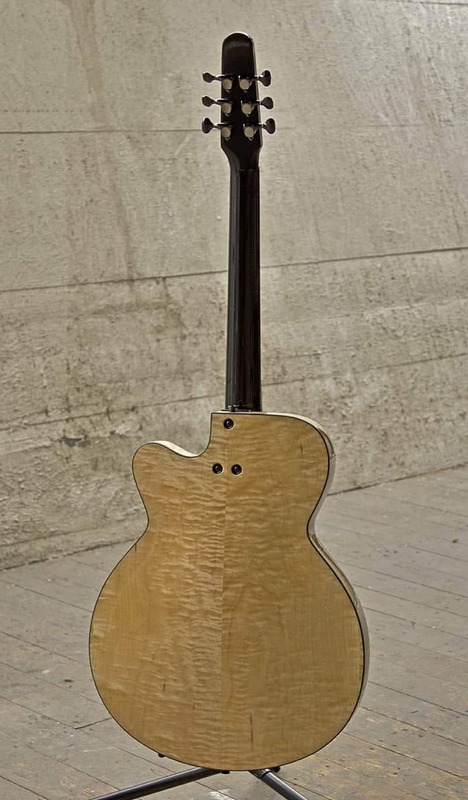 This is what you get when you cross a “Charlie” with as “Oscar.” The guitar body is the same as “Oscar” – a large, shallow full bodied jazz guitar. 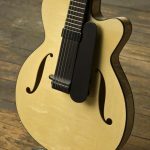 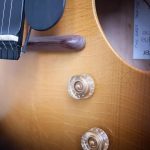 The classic curves are reminiscent of great American archtop makes like D’Angelico and Stromberg, but then I’ve added “Charlie’s” modern elliptical offset sound hole. 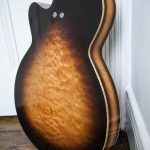 The guitar has a lovely vintage style sunburst, sprayed directly on the wood and finished with nitro cellulose. 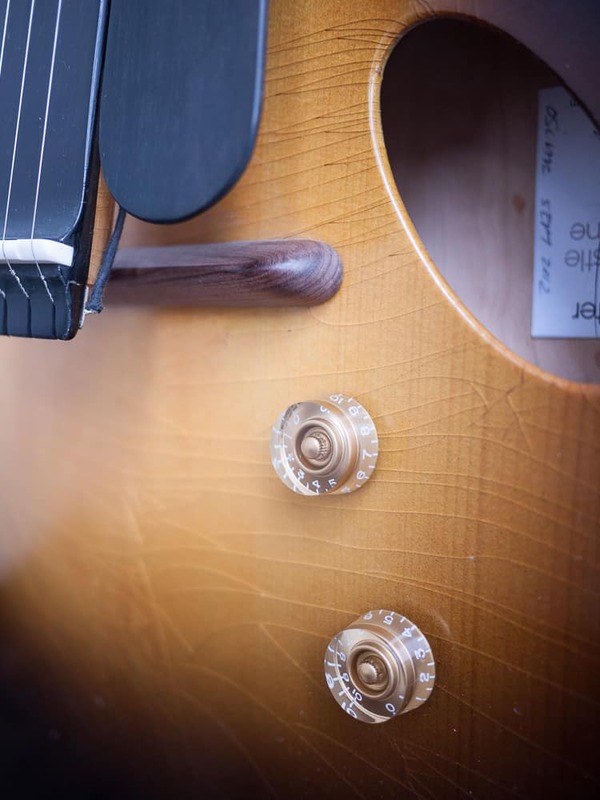 The guitar then had a little spell in the “time machine” to crack and craze the lacquer, and to bring up a lovely patina and luster that new guitars just don’t have. 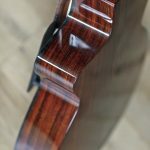 So who is Teddy? 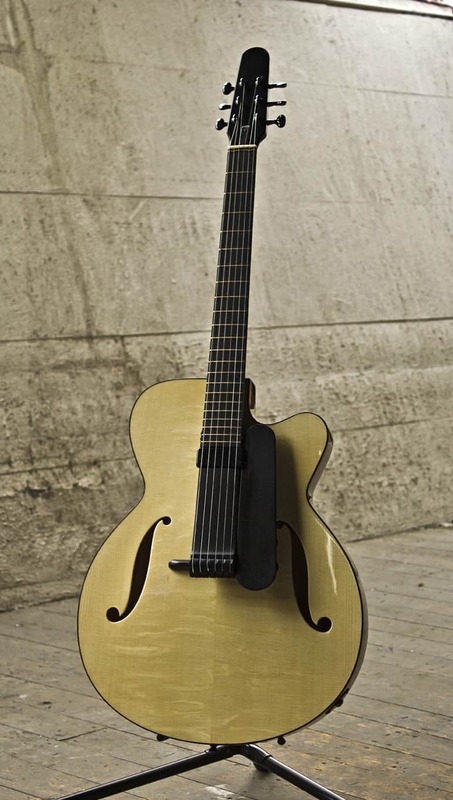 Well, in my 20’s, one of my favourite players was Teddy Bunn, a little known swing guitarist. 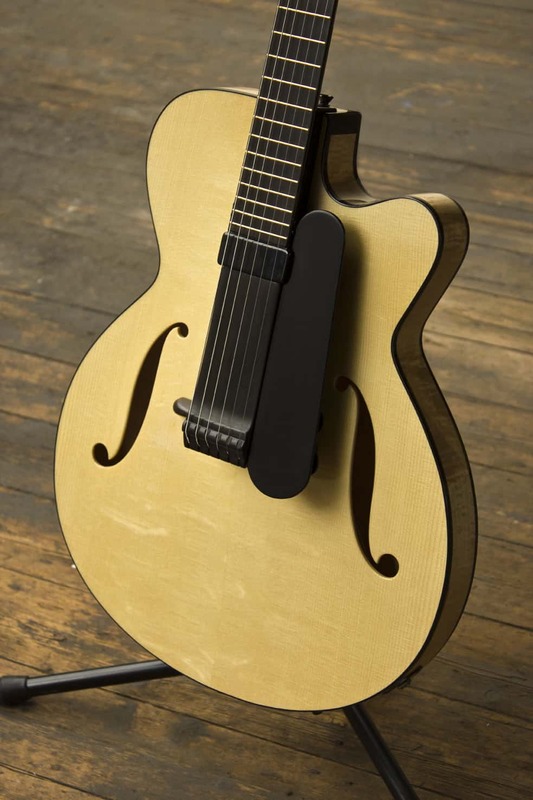 His music inspired this latest addition to my archtop range.